Harrogate Railway remain rooted to the foot of the NCEL Premier Division table after their winless run extended into a 14th game. Craig Ogilvie’s team took an early lead in Saturday’s home clash with Eccleshill United but eventually ended up on the wrong end of a 3-2 scoreline. Winger Aaron Kitao cut in off the left flank and finished past visiting custodian James Beck with only seven minutes played. The hosts’ time in the ascendancy was short-lived, however, Andrew Cooper heading home from a free-kick after a quarter of an hour to level matters. Shortly afterwards, Adam Shaw beat the despairing dive of Railway keeper Jacob Collier to put United 2-1 up and turn the game on its head. There were no more goals before the interval, but the second period was just three minutes old when Shaw reacted quickest to strike as the ball came back off the home cross-bar, putting Eccleshill in a commanding position. The men from Starbeck managed to stay in the contest and a glimmer of hope arrived eight minutes from time. 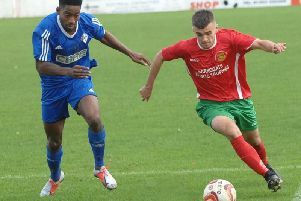 Substitute striker Fraser Lancaster spotted Beck off his line and took advantage superbly, lifting the ball over the United stopper’s head from 25 yards out. That was as good as it got for Ogilvie’s troops, however, as they failed to add a third goal in the closing stages, slipping to a second successive home defeat. 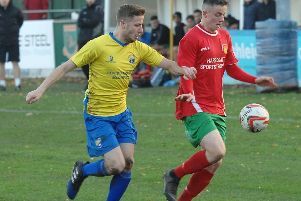 The Railwaymen remain just a single point behind second-from-bottom Goole, but are already four points shy of 18th-placed Thackley having played two games more. Next up for the Station View outfit is a home meeting with Garforth Town, 3pm kick-off on Saturday.